Fra-gee-lay. That must be Italian! A Christmas Story. And don’t shoot your eye out, kid! morning (along with several other items on my to-do list). Nothing like waiting until Christmas Eve! heel shoe, the fine line of the fishnet stockings (Let’s be honest; that’s what makes the lamp!) … It was a thing of beauty, if I may say so myself. Our opinions on beauty may diverge from here, but the important thing is what happened next. I decided not to ice the cookies. How could I cover up that detail?! That’s what made the cookies stand out and would be sure to give everyone at our Christmas Eve and Christmas celebrations a good laugh. No matter how much we plan (and we should! ), sometimes life throws you a better idea. Don’t rigidly stick to your plan (business, marketing or otherwise) and miss an opportunity to shine. Take a chance and follow the divergent path to see where it leads. It could lead to a brilliant new idea, unique product concept or branching off your business or marketing plans in a completely new direction. Because I know you were wondering, the leg lamp cookies were a hit (even without the icing)! I may have started a new family Christmas tradition and reminded myself of an important point to remember at the same time. What seemingly unrelated task has reminded you of an important business, marketing or life lesson? What is your favorite holiday movie? Tradition? I’d love to hear from you in the comments below or connect with me on the following social platforms. Where Has All of the Good Journalism Gone? Along with the rest of the nation, I watched in horror at the events that unfolded in Newtown, CT last Friday. I was out running errands for my business in the morning, so I didn’t see the initial breaking news coverage. I quickly checked my social media networks upon arriving home and noticed a few mentions of thoughts and prayers for Stony Hook Elementary School. Naturally, I Googled the school’s name to see what had happened. My first search result returned a close-up picture of terrified, crying children being led across the parking lot to safety. I was shocked. First, as I learned of the morning’s events, and second, at the photograph of young children that had been posted online and was spreading like wildfire. That image has been immortalized, capturing those children in a moment of sheer terror forever. Why? What news value does it add? Of course that was only the beginning as the rush to break the story led to quoting ‘anonymous law enforcement officials’ and publishing the wrong individual as the shooter. To further the misinformation, a Facebook profile and Twitter page were published that supposedly belonged to the (wrong) shooter. Wait, the Twitter page didn’t even belong to the misidentified shooter, throwing yet another innocent person into the spotlight. As a journalism major, I remember learning some of the sound principles of quality journalism. Accuracy. Accountability. Ethics. Legitimate, vetted sources. An accurate story was just as important as speed, and journalists were held accountable to a code of ethics (unless you ended up at the Enquirer, but I digress). In today’s world, we have instant access to social media and the Internet, which connects us all at breakneck speed. This always connected feeling and easy access to the masses has brought positive and negative effects. But has it killed quality journalism? Today, I came across an article written by Roger Ebert, a well-known film critic. It’s entitled News coverage, not movies, helps trigger Newtown-type tragedies. You can gather its point from the title, but it’s worth a read anyway. As always, Ebert makes a case for his opinion and gets straight to the point. As I read his article, it made a lot of sense. If this is true, then the current state of journalism and news coverage is more than sub-par; it’s helping to stoke the fire of violence in this country. As a journalism major, this just breaks my heart. What are your thoughts on the state of journalism today? Have the Internet and social media contributed to its demise? Are journalism and news coverage helping to contribute to the rash of violent acts in this country? I would love to hear your thoughts on this timely subject. Please leave a comment below or connect with me on social media to let me know your thoughts. Feel free to invite your friends to chime in with their opinions as well. p.s. Our thoughts and prayers continue to be with everyone in Newtown, CT. affected by this horrible tragedy. If you’re in the Canton / Akron / Cleveland area, come on out to First Night Akron. A fun time to be had by all, this New Year’s celebration in downtown Akron provides a variety of entertainment for all ages and includes two impressive fireworks celebrations. If you’re planning on ringing in 2013 at First Night Akron, we’d love to hear from you! It’s that time of year! The holidays are here and the best way to celebrate the New Year is right in Downtown Akron. 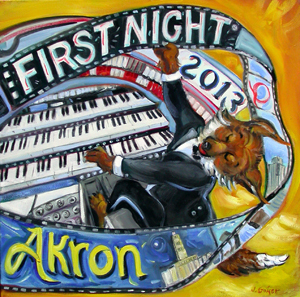 First Night® Akron is a family friendly New Year’s Eve celebration to entertain all ages as we welcome 2013. Admission button are $10 and children under 10 years of age are free. There will be a variety of entertainment, from music, arts and crafts, face painting, comedy, showcased art, a mass wedding, fortune telling, dancing, a wide variety of food, and fireworks displays at 9pm and midnight. Some of the coolest entertainment will be provided by JoyUNSPEAKABLE, a statue mime that moves randomly to surprise and interact with the audience. He looks like a painted statue but if you look closely he is a real person and will entertain you with his talents. Online Marketing & Your Privacy: Can They Coexist? As a marketing professional, I find myself in a conundrum. I completely understand companies wanting to gather information about me in order to present a more personalized experience. Targeted ads, relevant special offers, personalized product suggestions. But it’s scary. We live in a digital world, and identity theft and fraud are on the rise. If we don’t have our identity, what do we have? I’ve heard horror stories of people having their identities stolen and fighting for years to get it back, clean up their credit report, etc.. Recently, I read an informative article from Lifehacker about protecting your information online. It really made me think, and I proceeded to install some security plug-ins for my browser and strengthen my security settings. However, I soon ran into issues. Sites that I commonly use (and trust), such as clients, vendors and mainstream services, were rendered ineffective. I’ve already run into multiple instances where I couldn’t even log in to these sites without enabling cookies. Also, these plug-ins seem to be really slowing down my browsing experience. So what to do? What do you do? I did check out Lifehacker’s “The Best Replacements for Privacy-Invading Services,” along with other suggestions for bypassing some of these companies and services. But do I really want to forego Gmail and Facebook entirely? I can’t imagine removing my Facebook company page in lieu of a presence on Glassboard. Would you? Have you? As noted, I can definitely see both points of view as a marketer and consumer. I enjoy the personalized experience and convenience that information tracking allows. However, I’m at a crossroads right now. Security or convenience & personalization? Can these two sides ever coexist? I would love to hear your suggestions and experiences on how you live in our digital world while maintaining your privacy. I’m looking forward to hearing from you!